- Separate Electric Baking & Holding Ovens to pre Heating & Maintaining the Temperature of Welding Rod. - Pre Heating Element (Burner) for Base Material temperature monitored through Thermal Choke. Hydrogen Controlled Electrode for Mild, Medium Carbon, High Strength Steels, Cast Steels "Problem Steels" and Cushion Layer Under Hard Deposits. B & H Electrodes Pvt. 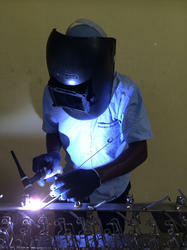 Ltd.
With the affluent proficiency, we are rendering SS Tig Welding Work. Our services are rendered by expert’s team. These services are extremely employed for industrial heavy fabrication. In this service, we use advanced machines and techniques to render this service in efficient way. With vast industrial experience, we are involved in offering a wide range of Stainless Steel Welding & Assembly. We bring forth our vast industrial experience and expertise in this business, instrumental in rendering Stainless Steel Welding Service. Welding is the most used method of joining stainless steel. It is a special process whereby different pieces of solid metal are joined, at molten metal temperatures, to produce a joint that should have the same (or better) mechanical and corrosion resistant properties as the base material. Banking on the understanding our personnel have received in the years, we are engrossed in the business of offeringSS Welding services to our clients. Credited due to their reasonable rates, these services are widely appreciated amongst our clients. More to this, our adroit workers are rendering these services in the most planned manner. 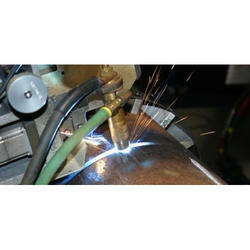 Matching up with the exact requirements of customers, we are involved in presenting wide array of SS Welding Service.